All Sam wants is to be able to move on with his life, to put the past behind him and create something entirely new for himself, but it may not be as easy as he had thought. While he’s trying to hold true to the promise he made to a friend, another friend wants him to pay up on his promise. Leaving Laura and the kids behind might be the hardest thing he’s ever had to do, but how could he turn his back on everything he’s built his life to be? A Higher Calling: Laura's Tale by Kwen D Griffeth is a story of love and devotion, but also one of vengeance and retribution. With this book you never know what’s going to come next. Each character draws you in and makes you want to learn more about them and what their story will hold. You want to see them grow and become even more and you definitely get that here. There’s plenty of romance for those who like that sort of thing, but there’s also some action that really keeps you on your toes. Whether it’s William or Ruby or Laura or even Pickles, you won’t want to turn away from any of the characters here. Even Abernathy will make you want to understand him better. A Higher Calling by Kwen D. Griffeth is the type of book that you’ll remember for a long time and you’ll still want to know more about everyone involved. I know that I was definitely drawn into this story. Beautiful Laura Stoddard, a young widow with two children, William and Ruby, was determined to make her father’s farm a success. In New Hope, Missouri after the Civil War, life is difficult at best. Sam Moses Cardiff had promised William Stoddard to look after his family after his death, and he intended to keep that promise. Although Sam had no experience as a rancher, adolescent William was willing to teach him about farming, and eager to have a father figure in his life. In A Higher Calling: Laura’s Tale, written by Kwen D. Griffeth, Sam’s past reputation was always a presence. The romantic tension between Laura and Sam was intense, but Sam promised her there would be no marriage until some things in his life were resolved. An attorney from Chicago, Archibald Wainwright Abernathy, brought some unexpected news, resulting in a confrontation between Sam and a group of men in Colorado Springs. Sam needed to leave the ranch for months to resolve this problem. This fictional work contains many historical facts – the effects of the Civil War, small town life in Missouri, including the general store and saloons, and harsh winters on a ranch. The relationship between Sam and Laura, as well as the one between Sam and young William, is realistic with believable dialogue. The characters are described well; it is easy to visualize each one. Author Kwen D. Griffeth has written an engaging and intriguing novel in A Higher Calling: Laura’s Tale. It is the second book in a series entitled Sam and Laura’s Story. This story takes some unforeseen turns – a good read! A Higher Calling by Kwen D. Griffeth is book two in the continuing saga of Sam Moses. After vowing to keep William Stoddard’s family safe, Sam Moses joins Laura Stoddard and her children in New Hope, Missouri. Sam Moses wants to leave behind his past of being a hired gun and become Samuel Cardiff the rancher and family man. However, Sam has much to learn. As the relationship between Sam and Laura blossoms into love, he becomes increasingly devoted to her and her children. All is going well until Sam’s past catches up with him. He must decide between two promises – avenging the life of one man or loyalty to another. Samuel Cardiff knows the only way to become the man worthy of Laura and her family is to put the life of Sam Moses to rest, once and for all. Kwen D. Griffeth creates a story of devotion in A Higher Calling: Laura’s Tale. Griffeth skillfully writes the consequence of personal choice, portraying the long-term effect decisions have on you and others. The narrative is intensely descriptive and enriched with historical information depicting the hardships of life after the Civil War. One of my favorite lines: “Just because it was sunny today, didn’t protect them from a storm tomorrow.” (Now isn't that the truth). The characterization is written decisively; every character enters and exits at precise moments and plays a vital role in the development of the story. The hero is an honorable man of his word, a straightforward, likable guy. Yet, he is internally conflicted by his dark past, struggling with the man he once was and the man he wants to be. As the story unfolds, hidden truth, turmoil, and desires of the heart are revealed, giving depth to his evolving character. A Higher Calling may seem like your average Old West, gun-slinging ride into the sunset kind of epic. But it is not. Your heart becomes intertwined with the quest of a life devoted to honoring a promise. A Higher Calling: Laura's Tale by Kwen D Griffeth is a historical fiction novel that provides a glimpse of life in the American West. A Higher Calling is primarily the journey of Sam, a man torn between trials and responsibilities. We are introduced to Sam, a Union Army veteran of the Civil War, after he has become the protector of Laura, whose husband has died, and her children. Sam had promised Laura’s husband before his death to take care of his family and that is how Sam and Laura’s connection is shown to develop as well. However, as Sam is settling into fulfilling his promise, he is brought to a crossroads when his friend is killed. He had also promised to avenge his friend’s death if this happened, and now he is in a terrible dilemma of leaving Laura to fulfill this promise or to break his promise and stay with Laura and the children. As Sam deals with his personal demons and challenges, this is his story of choosing and facing the right path. A Higher Calling is an intriguing story that contains many different elements, each of which can almost be classified as a genre in itself. This is a thriller, historical fiction, western novel that contains love and romance as well as plenty of adventure. Kwen is able to create vivid pictures of those times in front of our eyes as we see the story through the perspective of Sam and Laura. Sam himself is extremely likeable and relatable and I definitely found myself rooting for him. Laura is also depicted as a strong, independent character who knows her own mind. The engaging plot and the fast narrative make this a good read. A Higher Calling: Laura's Tale is the second book in the Sam and Laura’s Story historical fiction trilogy by Kwen D. Griffeth. 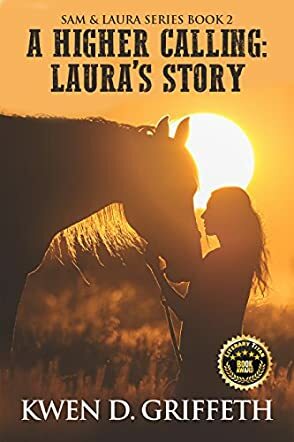 Set in the 1800s, in Missouri, Laura's Tale continues the story of Sam and Laura after he follows her and her two children to their new home on a rundown ranch, to fulfill a promise to her late husband to look after them. Sam and Laura each had a secret spark of attraction to the other while she was married. The story opens with them consummating their love for each other and discussing a future together. However, Sam receives word that someone has been killed to whom he promised revenge. Which promise will he keep, especially since one may result in his own death? I enjoyed this book. Griffeth’s storytelling is wonderful. The narrative, while slow in a few places, is descriptive, engaging, suspenseful, and emotionally evocative. I didn’t read the first part of the trilogy, so my understanding of the characters is based only on what is presented here. I like Sam. His altruistic side came through strongly, as did Laura’s sometimes quick temper and emotional neediness. Sam’s budding paternal relationship with Laura’s children, especially her teenage son, is touching. However, I wondered at the coincidence when, on Sam’s first drive into town, he encounters four people living there who either knew him or knew of him. That said, and with a very unexpected ending, this is an entertaining read that will leave you curious about what happens next to Sam and Laura.